With the bright color power meter display to analyze the harmonic spectrum, a low-pass filter to remove high frequency noise, and a high EMC immunity design, the Fluke 345 power analyzer is ideal for troubleshooting power quality on switching loads. 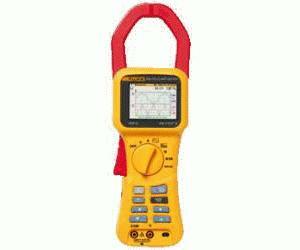 Additionally, the Hall Effect clamp meter design makes measurement of dc current possible without the need to break the circuit with the power meter. The internal memory of the power analyzer enables long-term power quality logging for analysis of trends or intermittent problems.